For starters, the victory gives Tiger Woods 81 career PGA Tour wins. 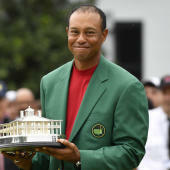 He now sits just one win behind Sam Snead's record of 82, and given what we've seen from Woods in the last calendar year -- high finishes at The Open and PGA Championship, a victory at the Tour Championship and now this epic Masters win -- it can be assumed that record is serious jeopardy moving forward. Woods needs a lot more success at the highest level to be able to catch Jack Nicklaus' major championships record, but this green jacket does get him moving in the right direction. Let's take a look at some more of the history that was made on Sunday, and be sure to listen and subscribe to The First Cut with Kyle Porter for our instant reaction to Tiger's historic win. Tiger's 15th major championship brings him within three of Jack Nicklaus' record of 18. Tiger's fifth Masters win also brings him within one of Nicklaus' record of six green jackets. Tiger is the oldest Masters winner since Jack's last Masters win in 1986. The 2019 Masters is Tiger's first major win when trailing after 54 holes. Tiger was denied a 15th major championship at last year's Open by Francesco Molinari, then again by Brooks Koepka at the PGA Championship despite Woods' final-round 64. On Sunday, he had to beat them both in order to finally break through with his first major win in 11 years.